The Alleycats were formed by guitarist Joe Staunton (ex Orphanage, etc) sometime in the early 1980s. A 1982 recording of "Fairy Story", recorded at Lombard Studios in Dublin with Philip Begley, surfaced on youtube. By 1985 The Alleycats were Fagan and Staunton with bassist Pat Courtney (ex Sacre Bleu, Xerxes, Daddy Cool & The Lollipops) and drummer Brain Downey (ex Sugar Shack, Thin Lizzy). When Peter Fitzpatrick (keyboards) joined in 1987, they changed their name to Talk To Strangers. The group played extensively around Ireland and included some Thin Lizzy covers in their live set, but they were primarily a blues outfit playing British Blues boom material of the late 60s in the style of John Mayall, Peter Green's Fleetwood Mac, etc. They had a long running residency in Slatterys of Capel Street. Gary Moore sat in with the band on one occasion, playing "Parisienne Walkways" and some blues standards. A demo was recorded (pre Fitzpatrick) and there are live tapes in circulation, including one recorded at Morans Hotel. For a short time Joe Staunton was replaced by Dave O'Toole on guitar. 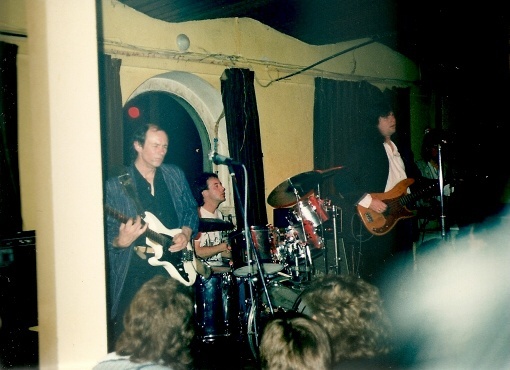 Brian Downey later called on the services of Pat Courtney and Peter Fitzpatrick for a one-off Thin Lizzy reunion with Eric Bell for the 1989 Vibe For Philo in the (now demolished) New Inn. Last update: 9 September 2010.